Iranian Foreign Minister Mohammad Javad Zarif says Iran, Turkey and Azerbaijan have similar stances on developments in the Middle East and are determined to strengthen joint cooperation. According to Press TV, Zarif made the remarks in a joint press conference in Istanbul, Turkey, on Tuesday with his Turkish and Azerbaijani counterparts Mevlut Cavusoglu and Elmar Mammadyarov, respectively, following their sixth trilateral meeting. “Cooperation among Tehran, Ankara and Baku is very important for development of the three countries, development of the region, the improvement of living conditions and the promotion of regional peace and security which is unfortunately facing with multiple challenges,” the top Iranian diplomat said. He expressed hope that regional issues, particularly problems of the Syrian, Palestinian and Yemeni people, would be solved peacefully. Elsewhere in his remarks, the Iranian foreign minister said the three sides also agreed to hold one meeting among their private sectors, adding it would be a “very important step” to boost regional cooperation. The Turkish foreign minister, for his part, said Tehran, Ankara and Baku oppose unilateral measures on regional issues and believed that common and multilateral decisions must be made in this regard. The three countries agreed that regional issues should be solved peacefully and through dialogue, he added. Cavusoglu called for the continuation of joint cooperation to promote stability, peace and security in the region and said trilateral economic ties would also serve the interests of all regional states. 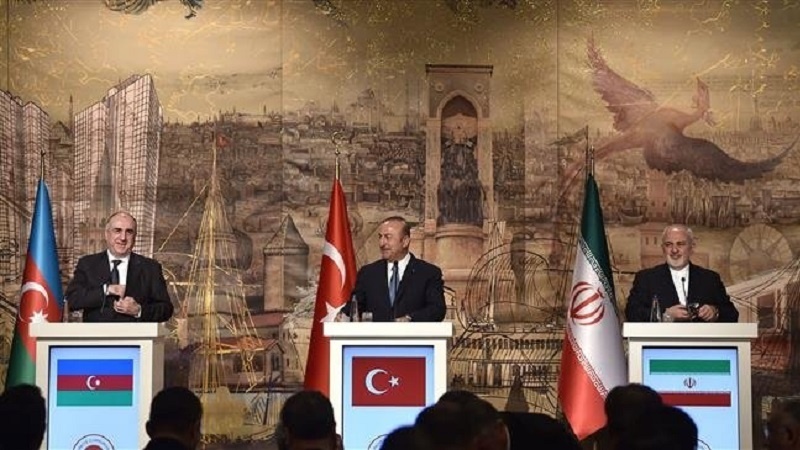 He further said Turkey has continued its cooperation with Iran after the United States withdrawal from a 2015 multilateral nuclear agreement signed between the Islamic Republic and the 5+1 group. The Turkish foreign minister emphasized that his country is holding consultations with European countries on the continuation of cooperation with Iran.